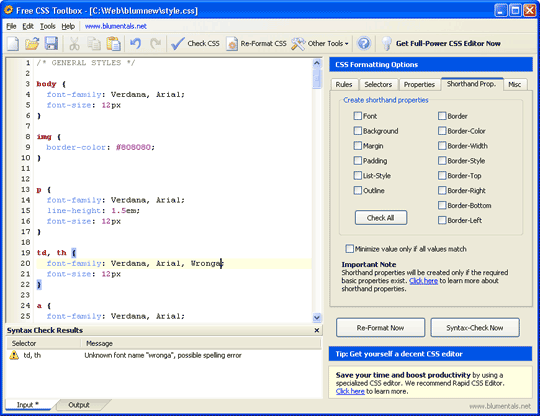 Free CSS Validator, CSS Formatter, CSS Compressor Free CSS Toolbox is a freeware productivity software for web developers who work with CSS code. Free CSS Toolbox includes a number of tools for fast-tracking and enhancing the development of style sheet code, such as an advanced CSS Formatter and CSS Validator. If you develop websites that use CSS, the Free CSS Toolbox can help you save time and increase productivity without any cost. Remove any DVD copy protection, like Region, CSS, ARccOS, etc. Qweas is providing links to Free CSS Toolbox 1.2 as a courtesy, and makes no representations regarding Free CSS Toolbox or any other applications or any information related thereto. Any questions, complaints or claims regarding this application Free CSS Toolbox 1.2 must be directed to the appropriate software vendor. You may click the publisher link of Free CSS Toolbox on the top of this page to get more details about the vendor.